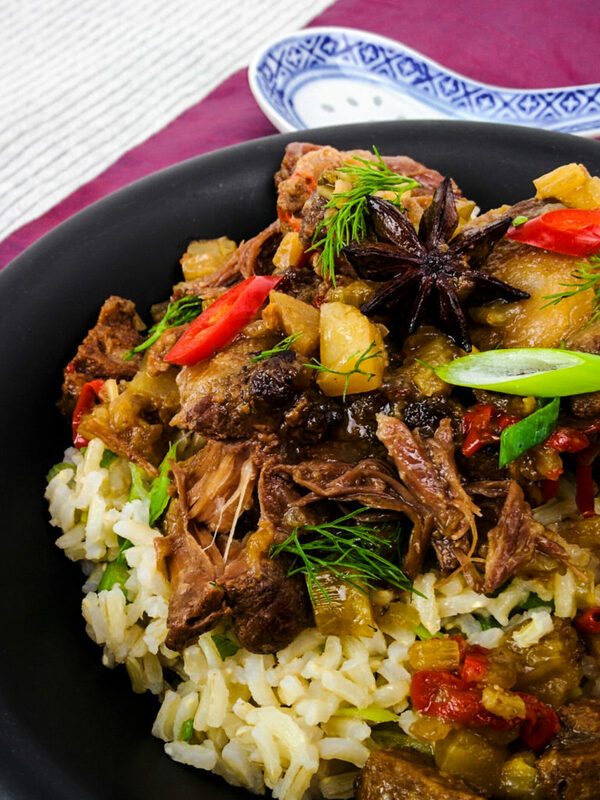 A Chinese inspired version of grandma’s favorite cut of meat: tender oxtail! Last month I started using Reddit and become an active member in the slowcooker subreddit where my Tom Kha gai sandwich was crowned one of the best recipes of February. Trying to come up with new slowcooker recipes, I realized that I created one 2 years ago that was never published. A friend of mine was looking for some new slowcooker recipes, so I created one and shot some photos. This is what you are finding now underneath. This recipe is my Chinese style take on beef oxtail stew. Garlic, ginger, Shaoxing wine and star anise give it a typical Asian flavor profile. Star anise enhances the taste of the meat and gives the whole dish a deeper flavor. That is the reason why you usually also find it in Chinese 5-spice mix. Oxtail is an inexpensive cut of meat that you will easily get at your local butcher as well as in many bigger supermarkets. It used to be one of those cuts that your grandparents used because not a single piece of the animal went to waste. It has been somewhat forgotten in recent decades but made a revival when upscale chefs reintroduced it to a younger audience. The oxtail has a lot of connective tissue that needs some low and slow cooking. You will be rewarded with the most delicious flavorful sauce though! The fennel gives the dish a nice subtle licorice or anise-like taste. I know that fennel bulbs can look somewhat intimidating in the supermarket, but you should definitely give it a try. Even though they really strongly smell like licorice when they are fresh, that taste gets knocked down and mellowed out quite a bit once it’s cooked. Fennel just works really well with tomatoes and fish, but also in this beef dish it adds a lot of character. Of course the best thing about this recipe is, that you basically just throw everything in a slowcooker and wait till the meat is buttery tender and almost falls off the bone. So easy, so satisfying! I suggest you dust your oxtail pieces in flour and brown them beforehand in a skillet like described in the recipe. This gives the dish some extra depth and flavor. If you are in a hurry or don’t want to dirty extra dishes you can skip this step. But then again, you are going to spend 8 hours cooking this delicious dish – you can spend 5 more minutes to brown the meat right? What are you waiting for, get cooking! Use some kitchen towels to pat the pieces of oxtail dry. Put the pieces into a freezer bag and add flour as well as some salt and pepper. Close the bag and shake to cover the pieces with the seasoned flour. Smash and peel the garlic cloves. Put a skillet on high heat, add the 2 tablespoons of oil and the floured oxtail pieces. Discard the bag with the rest of the flour. Add the smashed garlic and brown the oxtail on all sides. The meat doesn’t have to be cooked through. Fill your slowcooker and sit back! Dice the fennel into 1x1cm cubes. Reserve the green fennel leafs for decoration. Peel and finely chop the ginger, dice the onion, and finely slice the red pepper. Place the oxtail in the slowcooker, add the diced vegetables, soy sauce, cilantro, star anise and rice wine. Pour in the chicken stock and give a good stir with a spoon. Turn on the slowcooker and let simmer on low heat for 8 hours. The meat should be so tender that it pretty much falls off the bone. Serve up some rice, spoon over the meat and another big ladle of the sauce. Decorate with some sliced spring onion, red pepper and fennel green! Have you ever prepared oxtail before? Do you like the taste of fennel or do you find it overwhelming? Let us know in the comments below!